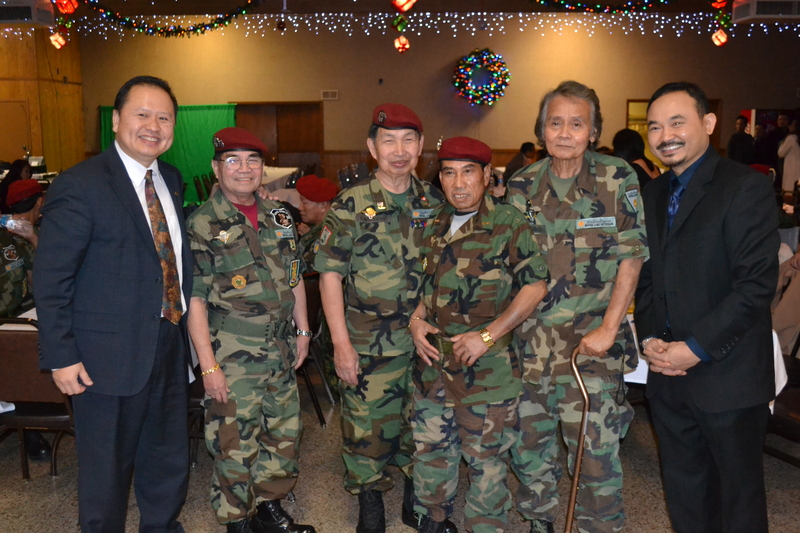 MN State Senator Foung Hawj, Col. Khao Insixiengmay, Saysana Pommalth and Lao veterans at the Knights of Columbus on Saturday, November 30th in Bloomington, MN to support the construction of a memorial monument. 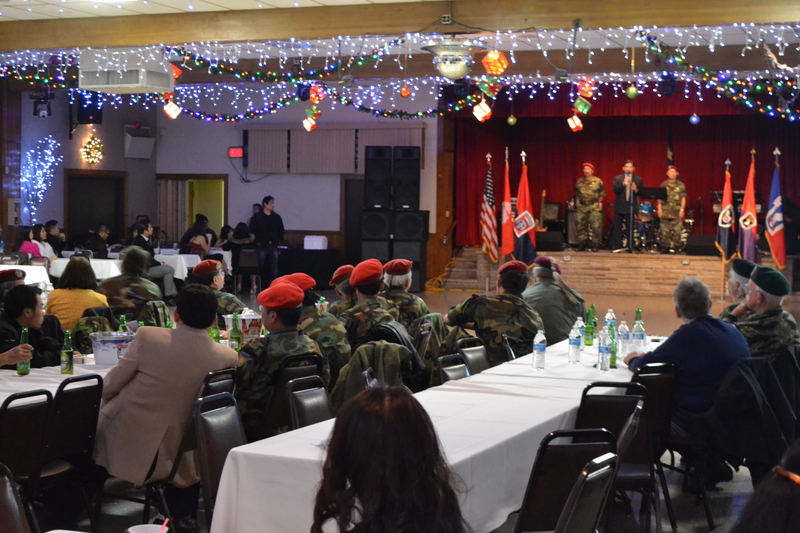 On Saturday, November 30th, community members from across the country gathered to join the Laotian and Hmong veterans of Minnesota in a benefit fundraiser to support the construction of a memorial monument on the Minnesota state capitol grounds. The memorial has an anticipated completion of 2016, if they can raise the final $80,000 by December 31st. The State of Minnesota has already committed $350,000 of the $500,000 cost, and additional efforts in the community had raised $70,000 by November. But the community is now in the final month to raise funds or the project will not go through. The evening gathered at least 200 members from the community throughout the evening, including Illinois film-maker Mychal Mitchell and his family. Mitchell helped to make the film Princess of Laos possible and was very enthusiastic about this project to recognize the men and women who served during the Secret War. 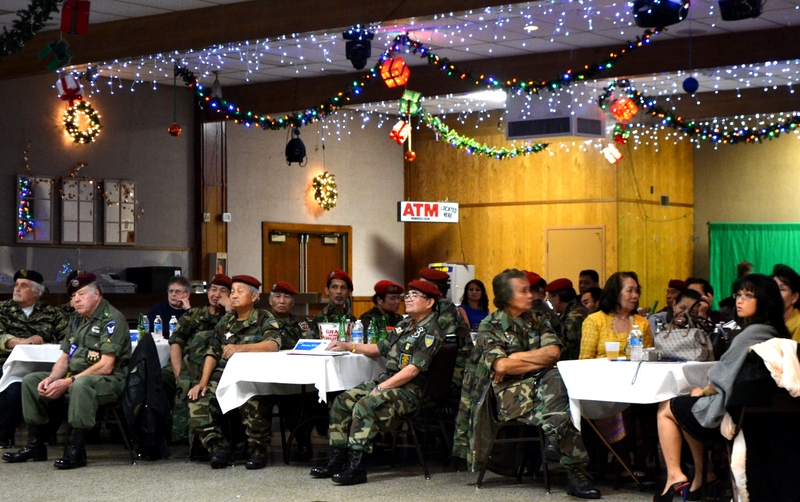 The fundraiser’s organizers had a slideshow of the many different aspects of the war for Laos and the veterans who had been a part of it. Minnesota State Senator Foung Hawj was on hand to explain the progress so far on the monument and what it would mean for all of our communities. The memorial would set precedent in the United States as the first to be located on grounds of a state capitol. It would also include a time capsule that would be opened in 100 years for the next generation to hear and learn about the stories of their elders. Minnesota has the third largest Laotian population in the United States next to California and Texas. This includes ethnic Lao, Khmu, Tai Dam, Mien, and Hmong. 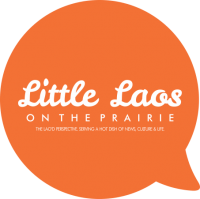 It has been host to numerous groundbreaking national events including the Laotian American National Alliance Conference, the National Lao American Writers Summit, and the Legacies of War: Refugee Nation Twin Cities interdisciplinary exhibit. 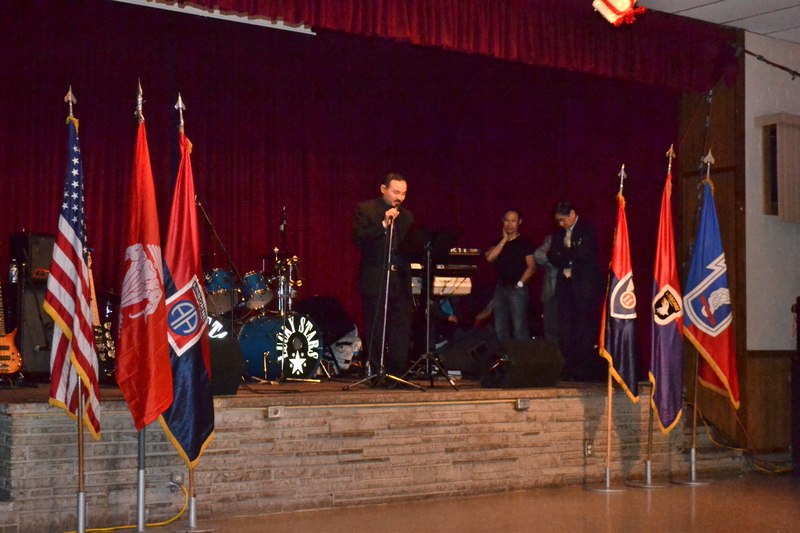 On behalf of the Royal Lao Veteran of America, and the monument fundraising committee I would like to welcome you to our first monument fundraising party hosted and organized by the Sons and Daughters of the Royal Lao Veterans. I am your host Saysana Pommalath along with Lee Southivongnorath. I would like to thank all the veterans for your support and guidance, especially col. Khao Insixiengmay for allowing me to continue your work on this amazing project. Also, I would like to thank all of you that are here tonight, including those that are from other States and surrounding cities. Thank you. When I first volunteered for this monument project, so many people have asked me, why are you supporting this project? You are so busy already. You have a full time job, and a family that needs so much of your time. No one cares about the veteran’s monument. Everyone has forgotten about the “Secret War” in Laos. It has been over 50 years, let it go. Then I wondered, are they asking me to forget my father and the sacrifice that he made? How about our veterans, are we to forget about them too? I simply cannot! When I was only 2 year old, my father Col. Vonthong Phoumala was at the height of his career as a Royal Lao military commander and a Special force guerrilla unit commander. He came to US to study at the West Point Military Academy and trained at Lack land Air force base. He dedicated his life to the military and was loved by his superior and comrades. He stood by his troops and fought side by side on occasion. Whenever any of his soldiers fell in the line of duty, no matter what rank, he would take the time to attend their funeral and pay respect to the family. Still today, people remembered him as a compassionate and devoted commander. When he learned that the country was about to fall and there wouldn’t be any more support from the United States. Instead of fleeing the country, he decided to stay behind with his troops and hope for a better outcome. In the midst of chaos, the communist demanded a military leaders meeting negotiation in exchange for a peaceful seize of the country. For the love of the country, it’s no surprise that he would attend the meeting and face the enemy at the losing end. It must have been the hardest decision he has to make. I cannot imagine leaving my family to face the enemy and knowing that I might not return home. When the day comes, he said good bye to my mother and all of us before heading to the meeting. It was the last time I ever saw him again. After my father was gone without a trace, they also imprisoned my mother in a concentration camp for five years. Anything we had was taken from us. My siblings and I lost everything and became orphans overnight. When our mother finally was released from the prison camp, she was never the same. My story is just one of many stories of tragic, courage, and sacrifice. I am certain that so many have suffered the same faith or worst. When people talk about the Secret War it’s always about battle against the communist, how we help the CIA, and who did what? Not very many people talk about what happened after the Secret War. What happened to the people that were left behind? What happened to the landscapes that were bombed every 8 minutes, 24 hours a day, seven days a week for 9 years? The fact is, Laos is the most heavily bombed country in the world more so then all the bombs in World War 2 combined. I can only imagine the negative impacts these bombs have on the people, the forest, the agriculture, and the ecosystems. Now, who wants to talk about all of that? Why would anyone want to remind themselves of the pain and the suffering they’d endured? It all makes sense. No wonder the Secret War is still a secret because no one wants to talk about it. Perhaps, this monument can be a starting point of a conversation about the Secret War in Laos and the impact it has on Laotian here in the State or the country of Laos. Nevertheless, it will be an educational source for some people and hopefully they’ll start asking the right questions. To me, the monument means bringing honor to those that sacrificed their lives to the Secret War and also serves as a memorial. The Secret War in Laos was a direct extension of the Vietnam War and we had a big part in it. We went all-in and we are still paying for it today. When someone you love passed away you have a place to go mourn and put beautiful flowers. For me, I have no place to go because there isn’t a single trace of my father but faded memories. If this monument means nothing to you, you are the lucky one. For the rest of us, the monument means everything. It is a place for us to mourn, pay respect, and heal. I cannot forget the tears and the blood that was shed. I cannot forget the hardship we endured and the families we left behind. I cannot forget those that sacrifice their lives for us so that we can be here today. Our history is all that we got and it’s also our identity. Let us come together and make this monument a reality. Thank you. Further efforts to raise funds will soon be announced. The timing of the monument is significant as Laos prepares to celebrate 60 years of independence and 40 years since the beginning of the Lao Diaspora in 2014 and 2015 respectively.